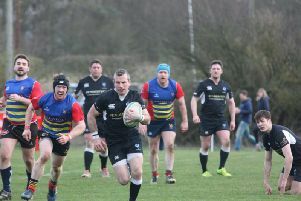 Duns entertained Linlithgow in their final home fixture of the season at Castle Park on Saturday – and after a lacklustre first half they eventually found their form to record a bonus point win. Linlithgow have been something of a bogey team to Duns in the last few seasons, with the previous seven fixtures between the sides ending in six wins for the men from West Lothian and one match drawn. Duns, however, came into the match on a run of great form, but were without the services of Allen Whellans, Mark Alexander, John Walker and Josh Herbert for a variety of reasons. Ged Lamb also failed a late fitness test, and so the side was short of five of the previous week’s squad. The pitch was in fine nick for the contest, and with no rain, only a light breeze and some sunshine, conditions were set fair for a great game. What a pity, then, that for the first 40 minutes both sides failed to deliver, and the large crowd was treated, if that is the correct word, to an error-strewn, turgid, half of rugby. Duns received the kick-off, and almost scored from the opening phase of play. They were halted deep inside the Linlithgow 22, but a visiting defender had strayed offside and a penalty was awarded. Lewis Craik shaved the post with his effort from wide out. Linlithgow also had a penalty attempt at goal with a quarter of the match gone, but again the effort was wide. However, their kicker was successful five minutes later and the visitors took a 3-0 lead. Duns picked up the tempo of the match, and on the stroke of half-time Craik drew the scores level with a penalty goal, so the teams turned round at 3-3. After the interval Duns were a transformed side. The home team kicked off and immediately regained possession of the ball, and after it had been taken on a couple of times by the forwards a short pass to Tom Swan saw the burly centre barrel his way through a couple of tackles to score between the posts. Craik added the conversion. Straight from the restart Duns were on the offensive again. After being unlucky not to score up the right wing, the home side quickly threw the ball to the left. Dale Robertson spun out a long pass to Charlie Woodhouse on the left wing, and he powerfully ran through two defenders to touch down in the corner for his maiden first XV try. Craik kicked a fine conversion from the touchline. At this stage Linlithgow had no answer, and it came as no surprise when they received a yellow card for persistent penalty offences. Duns had their tails up, and scored try No.3 from short range following a ruck five metres out from the line. There was a two-on-one on the blind side, which was exploited by scrum-half Hayden Martin, and the club’s very own Peter Pan dummied to pass to the wing and then dived over. Once again Lewis Craik kicked the extras from wide out. Linlithgow seemed to be spurred into action by this barrage from Duns, and enjoyed their best spell of the match. The home defence held firm, despite a yellow card for Gordon Harkins, who ‘took one for the team’ as the referee’s patience snapped. Harkins was reintroduced to the match when the game stopped for a scrum to Duns, and the bonus point try was scored straight from that scrum. A quick move down the blind side ended with Murray Perring crossing in the corner. With the clock running down, Duns scored their final try – a carbon copy of the previous one. The home side had a scrum less than 10 metres out, and Bert Grigg picked up from No.8 and broke blind. Hayden Martin received Grigg’s pass and quickly shipped the ball to Woodhouse, who went over in the corner for his second of the game, with Craik converting. This was, eventually, another excellent performance from Duns, and the transformation in the side has been remarkable in the space of a few months. The first five matches of the season yielded only two points from a possible 25, but the most recent five matches have all been won and have brought 24 points from a possible 25, and there is now a gap between Duns in fourth place and Berwick in fifth. There is now only one league match remaining this season – away to Penicuik in two weeks’ time. Duns: Thomson, Ryan, Swan, Robertson, Woodhouse, Fleming, Martin, Murphy, Harkins, D Turnbull, S Turnbull, A Tullie, S Tullie, Grigg (captain), Craik. Replacements: Smith, Redden, Orr, Perring.